Phew! Life just gets busy sometimes!!! So tomorrow, I am hanging my first solo show! It starts tomorrow and will run through the end of September. Then, September 3, we hang a two person show which will run through the end of November. Needless to say, I am up to my eyeballs in tape, paper, frames, mat board, drawings and paintings. In the meantime tomorrow, I also pick up the scan of “Bathing Beauty” and prints for my Kickstarter project, so will be up to the elbows in mailing supplies!!! And you wonder what I do in my spare time!!!! 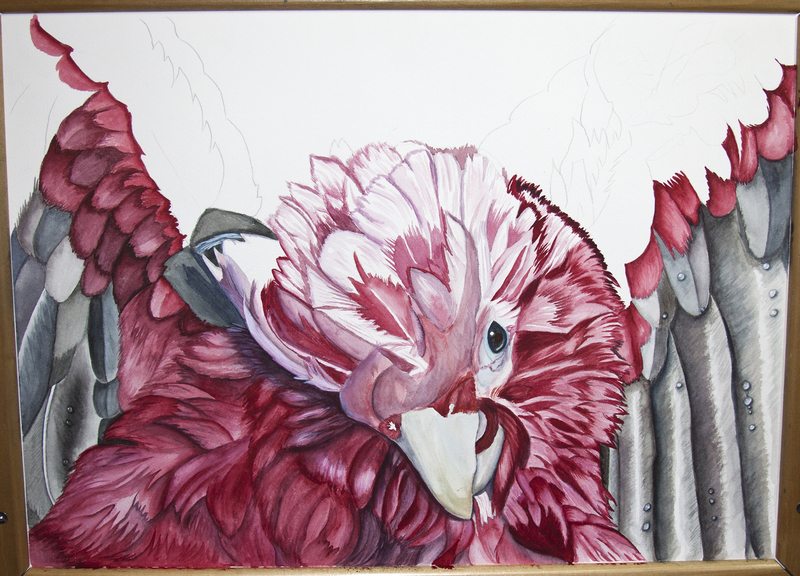 So, here is the start of a new painting, hope to get it completed in time to send it to Loro Parque for the big parrot convention there! Thanks to Maik for the ref photos and permission to use them! Once again, I find myself looking at the calendar, realizing that it is July and wondering where the year went?!?!??!? What is up with time? it used to go by so SLOOOOOOW, now it is rushing by at the speed of light, and I am not even used to writing 2014 yet. Better get the Christmas decorations out quick, or I will miss it too! There is a WIP in the works, believe it or not, here is the latest version of “Bathing Beauty”. It is over due, as we just returned from some much needed R&R. We attended a family reunion in Angel Fire, NM. The weather was fabulous, we enjoyed the cool mountain air, visiting with family, the scent of pines, and daily afternoon rains. We missed a huge sandstorm, and came back to 109 degree temps with monsoon humidity. Mean while back at the cat hair saga……have you ever tried to put a bandaid on your toe in a house full of cat fur? I got to try it last night, and let me tell you, after going through a whole box of bandaids, I finally got one on with only one cat hair in it. Any of you cat owners out there…….buy stock in bandaids! As I type, one of the cats has decided to take up residence on my asdfjkkllill;’,mnbnvcttyuioop, oops……… Keyboard. Oh no, now there is long black cat hair all over my keyboard and stuck to the screen. Cats 5 – Arlene 0. Excuse me a moment….there goes the phone…..hello…..uh excuse me while I go to the back room, my parrots are all screaming, hello……..uh….excuse me while I get all of the cat fur out of my mouth…..OK, uh hello…..click……buzzzzzzzzzzzzz….Hmmmmmm guess it was a wrong number. Hello Charlie…..Hello Loki…..Hello……Birdie and Sunny. I am off the phone, you can all stop screaming now. 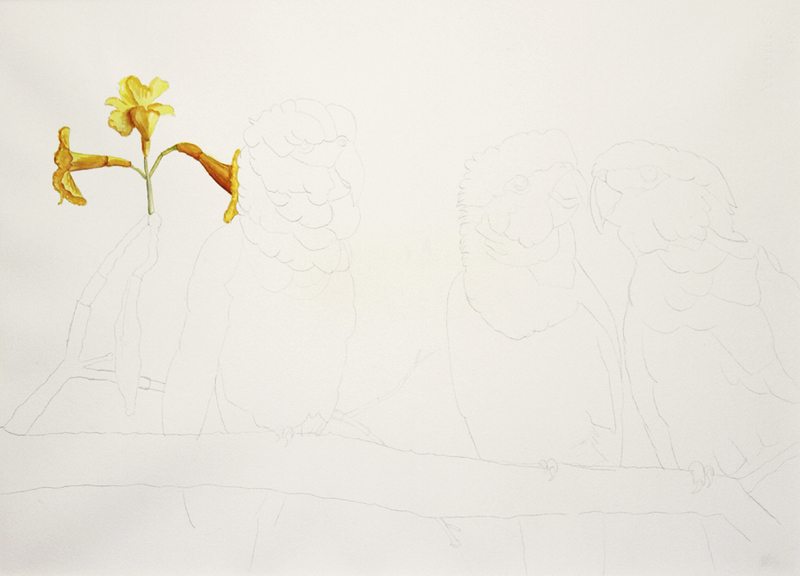 Parrots 1,253 – Arlene 0 Ohhhhhhh sweet silence, so much better. Oh no, here comes the cat again!